Get ready to cancel your Automobile Club membership. 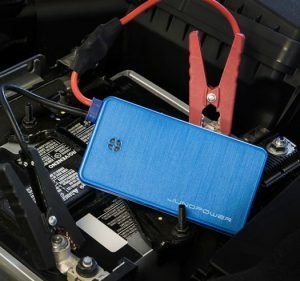 “Jumpr” is the size of a cell phone and can start a dead car battery. We’re awed. It’s hard to believe that something that weighs only two ounces more than our smart phone has the power to jumpstart a car. Jumpr, $90 at JunoPower.com, delivers 12-volt, 300 amp output and comes with a jumper-cable attachment. It might not be enough power to start up a V8 engine, but it should work OK on four and six cylinder engines. It can also charge your smartphone. You can look up a YouTube demo of it. It’s supposed to be available in June.